For many people, energy bills are extremely high during the summer months. The constant need to run your air conditioner can really take a toll on your wallet and have you looking forward to cooler months. Fortunately, though, there are several things you can do to lessen summer’s impact on your wallet. Check out these easy ways to improve energy efficiency during the summer. If you spend the majority of your day away from home, turn off your air conditioner. Too warm to turn the system off completely? At least set the thermostat a bit higher while you’re away so they system doesn’t have to work quite as hard. Programmable thermostats are pretty amazing when it comes to saving homeowners money. With one of these devices, you can set your air conditioner to keep your home at a higher temperature while you’re away and cool it back down before you arrive home. 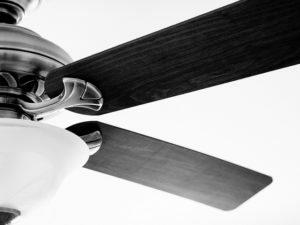 While ceiling fans don’t actually make your home cooler, they make you feel cooler. Set your ceiling fan to spin counterclockwise to create a comfortable breeze. When you have the breeze from your ceiling fan keeping you cool, you can turn your thermostat up a few degrees without sacrificing comfort. Your HVAC system isn’t the only thing that has a thermostat. Your water heater has one, too, and if it’s set higher than 120 degrees, you’re wasting energy. Lower the temperature to immediately reduce operating expenses. Many devices draw electricity even when they aren’t in use. Plug them into a surge protector that you can switch off when you aren’t using them. As a bonus, using surge protectors also protects these devices from damage. Even a minor problem with your cooling system could waste a lot of energy. Keeping up with AC maintenance is the best way to ensure that minor problems are detected and corrected to allow your system to operate at peak efficiency. At Larry & Sons, we are here to help you take care of your home’s systems throughout the year. Whether you need a hand with AC maintenance, installing a programmable thermostat or just trying to find ways to improve your energy efficiency, we’d be more than happy to assist. Contact us today by calling 301-733-5428.